The Flash #47, by writer Joshua Williamson and artist Howard Porter, finally kicks off the Flash War arc, and boy, is it a strong start. Previously, Wally West met his aunt Iris for the first time since the New 52 started, and all of her memories of him came flooding back. Unfortunately, it also sparked something in Wally’s mind that has him remembering everything from before reality rebooted...and it’s kind of driving him mad. 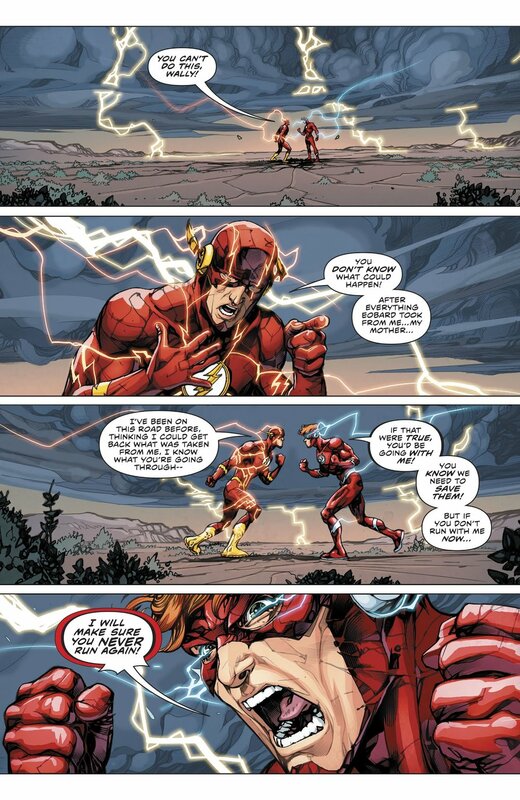 Williamson dives right into the conflict between Barry and Wally, and really plays up the deterioration of their relationship. In the previous arc, Barry made some poor decisions in his attempts to get his powers back. Now, with Wally’s brain being scrambled by visions of another timeline, it’s his turn to make bad choices, it seems. Thankfully, those choices are backed up by a much better reasoning than when Williamson did this with Barry. With Wally’s brain on the fritz, it’s natural that he won’t be thinking straight, so readers sees him struggling in the scenes where he tries to run away with Iris or when he meets up with Zoom. As hard as it is to see this fan-favorite character do questionable things that will have lasting negative effects, Williamson is building up to the inevitable reasoning that will lead the Flashes into conflict perfectly. In addition to the slowly-unraveling mind of Wally West, the readers are also treated to a very fun action sequence involving the Flash Family and the Renegades (a police force from the future that resembles the present Flash’s Rogues). This scene, where the Renegades come back from the future to arrest Iris for the murder of the Reverse Flash, really is the meat of the issue, and Williamson makes a meal out of having the Renegades take apart the Flashes as they squabble amongst themselves. Between the Flashes being distracted, the Golden Guardian revealing that she is a member of the Sinestro Corps, and Iris having to step up as the voice of reason in all of the chaos, there is plenty of material here that drives the story forward in the most enjoyable way possible. Howard Porter’s art is always welcome on a Flash book, and he makes the most of his action scenes, delivering clear, precise storytelling that would rival anybody in the business, but there still seems to be something missing from his work this time around. His figures and facework seem a little less tight than usual, and there are times when Barry and Wally seem more muscular than they should be. It could be that he needs an issue or two to reacquaint himself with the characters, but an artist of his history has certainly earned the readers’ patience for an issue or two. Hi-Fi also does a wonderful job on the colors, blending well with Porter’s unique art style, and adding a coolness to the action, especially in the scenes where the Golden Guardian creates a bunch of ring constructs that look like Reverse Flashes to fight the Flash Family. All in all, this was a solid start to this hugely-anticipated storyline, and if the last panel doesn’t make you wring your hands in anticipation of the next issue, then this just isn’t the book for you. This is the story long-time DC fans have been waiting for: Wally remembers everything, and he is not happy with all that he has lost. Couple that with the fact that Barry was seemingly responsible for all of the changes to the timeline in the first place (see Flashpoint), and it’s easy to see that this story could have long-lasting effects on the DC universe as a whole, not to mention the Flash Family itself.